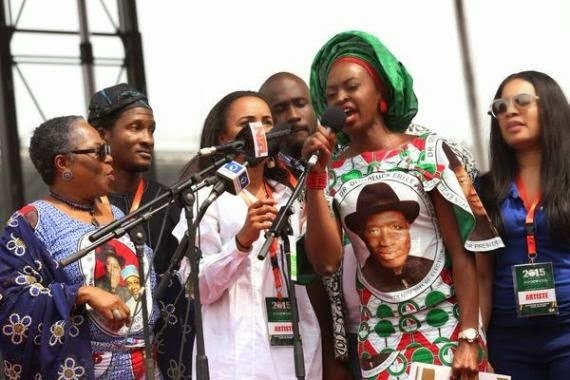 A lot of Nollywood celebrities including AGN president Ibinabo Fiberisima, along with Kate Henshaw, Segun Arinze, Joseph Benjamin, Onyeka Owenu, Monalisa Chinda, Fidelis Duker and more showed their support as they attended and were on stage during the PDP rally featuring President Goodluck Jonathan in Lagos yesterday. Your Excellency, the chairman of our great party, Alhaji Adamu Muazu, senior members of our party here on this great occasion, we have spent so much time here so I will not bore you with protocols. Today, I am going to address only a segment of the Nigerian population. I am going to address the people who are voting for the first time, those of you who will attain 18 years this year. That means I am addressing the young people. I do not want to address old people like me, because we are spent already and I will crave your indulgence Nigerian youths, those of you who are here, and those of you watching us at home, listen to what I am saying. I am going to address political gatherings in 37 cities and I am going to dwell on three key things. I am focusing on the young people. 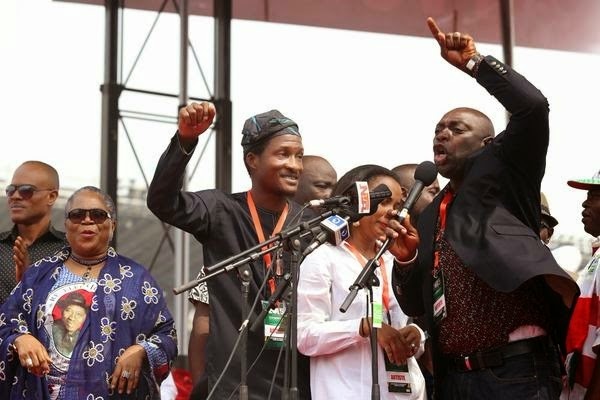 Whatever I say, when you go back, call your aunts or call your uncles, your father or your mother, or your cousin, that is at least 60 years old and confirm and ask them what you heard that the Presidential candidate of PDP mentioned in any of the rallies because 2015 elections is about the young people: either you vote and continue to be relevant in Nigeria’s political history or you vote for you to be irrelevant. And I will repeat it, those of you who are voting for the first time, your decision to vote could mean you vote for a Nigerian youth to be important, to be relevant in this country or be a Nigerian person to be treated as a nonsense person and I believe all of you want to be relevant. Of course you have seen…we have just introduced our governorship candidates and you see how many of them that is of your age bracket. Which other party will give that kind of opportunity? I am going to dwell on three things because those who say they want to take over power from PDP have been telling a lot of lies. They have hired people from all over the world and those of you in the social media carry all forms of lies, painting all kinds of colour and giving me all kinds of face that I cannot defend. If you listen to us in the 37 places we will address these issues, you will now know where to cast your votes. I will address you in all the places on three issues. The first is the issue of insecurity. I am also going to address whether this administration is fighting or encouraging corruption. I am going to address the issue of weak government and unfocused government that has no plans. Yours is to listen and compare with everything that has been done before in this country and take a decision. I will not keep you here for too long because we still have the opportunity… I am going to raise just very few issues today and tomorrow I will continue in Enugu and then on and on and on. First let me tell you about the voter’s card. First when we came in here we saw some placards, some of you complaining that we are yet to get a permanent voters card. Only yesterday, I directed that every Nigerian (of voting age) must vote. INEC must make sure and government will not allow a situation where some (eligible) Nigerians will not vote; we will not allow it. All Nigerians must vote and I mean it. I told you that I am addressing those of you who are voting for the first time. Those of you in the age bracket of 20 to 24, if you go back, ask your uncles, before 2011 no Nigerian complained that he had no voters card. People voted themselves into office. We came and said every Nigeria vote must count and since then, the voter’s card has become relevant. Nigeria must move forward, Nigeria is for the youths. Nigeria is not for old people like us. The young generation must redefine this country. We must take this country to where we want it to be. Nobody can push us backwards. The past is past. They have led us backward and backward. In fact when we were young, we were told that at Independence, Nigeria, Brazil, Malaysia, Indonesia and even India were all at the same level. These people did not buy anything for the Nigerian soldiers. They refused to equip them. No attack helicopter, nothing. Ask them what they did with the defence budget for the whole time they were in office. No country equips armed forces overnight. What they use is quite expensive and they are built over the years. Even if you spend 10 billion dollars today, you cannot equip the army, navy and air force. The capacity is built overtime. They refused to build the capacity. They instigated crisis and now they are telling us they will fight insurgency. Ask them and they will answer. I will elaborate more as we progress to other places. The next is that they say government is corrupt; or we are not fighting corruption. Only yesterday, I addressed the anti-corruption agencies. I said look people are deceiving young Nigerians. You must tell Nigerians what you are doing. We have arrested more people within this period. Gotten more convictions within this period but everyday they tell us lies. At this point, let me apologize to some Nigerian civil servants who did not receive their salaries in December early enough and I will tell you what happened. I apologize to those families that suffered because we believe that for you to fight corruption; you must take measures, establish and strengthen institutions. You just don’t wake up, enter the street, arrest one person and lock up and show on television and say that you are fighting corruption. I served in Bayelsa as deputy governor and governor for eight years; I also served as Vice President and President for another four years at the centre, for all this period, the fertilizer area is where states and federal governments spend billions of naira but less than 10 per cent of fertilizers go to the farmers. The rest is stolen and sent out of the country. Even the 10 per cent sometimes is adulterated. We came and cleaned up the sector and today there is no corruption in the fertilizer industry again. So arresting people and demonstrating on television will not fight corruption, we must set up institutions, strengthen them to prevent people from even touching the money and that is what we are working on and we are succeeding. Some people say they are finding corruption… some of you know, I am not addressing people of 20 years and below but people from 30 years and so on… Nigerians go to fuel stations and sleep overnight to buy fuel or tip those who sell fuel to buy fuel. They hoard fuel and they benefit from the hoarding. Who are those who benefitted from hoarding fuel? Since we came on board, have you suffered? Do you need to bribe someone before you get fuel? When the crisis of insecurity came up, we had nothing. So to get things very quickly, we used some vendors to make procurement. But now what we are doing is government to government. Now any new procurement we are doing whether for the air force, navy or army it’s government to government, so there is nothing like corruption anymore. Even if we have some issues, maybe… is that not the way to fight corruption? You must prevent people from touching money, you don’t give them the opportunity or test them with money and this is what government is doing and we are succeeding in a number of areas in our procurement processes. The relevant agencies will address Nigerians for you to appreciate what we are doing. They say the government is weak, they say we are un-focused; we have no plan. They say we are weak because there were some people who took our fathers, our mothers and our uncles while they were abroad put them in a crate and flew them to Nigeria but they were intercepted by superior powers. That blocked Nigerians from even going to Britain at a time and the relationship between Nigeria and Britain… the whole world isolated Nigeria. If somebody tells you that he will not follow due process… I came in with Yar’Adua and he advocated due process and I stand by due process. Any country that does not abide by the rule of law is a jungle. A country is like an industry. It must be managed properly by people who have brain and great ideas upstairs. This government feels that Nigerians are very dynamic people, very creative, very industrious, very talented in music, arts and business. Many of them do not have money and you know we are almost 200 million in Nigeria and we cannot reach everybody the same day. We came up with the concept of YOUWIN to give grants not loans to young Nigerians that have ideas. If you interview them, some of them are already manufacturing and in the next four to five years, we will be exporting things from this country. And they say we have no plans for the youths? They should come and tell us what plans they have for the youths. I believe that young Nigerians, not people who are spent and finished. not people of my age, we are gone… that is why I said I am addressing people from the ages 18- 23 those who are voting for the first time, we believe that you people will take us to the moon. My generation has failed we couldn’t take Nigeria to the moon. Look at what India is doing. Look at what countries we were at par with at independence are doing and I said for us to get to the moon, that’s a special area; you need to expose your best brains. When I came on board as President, I noticed that though in the country and on paper, there is this programme or policy of government that every state must get a Federal government owned university. Out of the 36 states we have, 12 had no federal universities and people were deceiving Nigerians that they were doing something. I said we must establish these 12 universities in the remaining 12 states, start as small universities and grow and we have done that successfully and they are growing gradually. We did not stop there. We looked at the school drop-outs in some parts of the country and they were quite high. We came up with the Almajiri educational programme and we thank the Governors from many of the states where we have those set of students. We have programmes for Almajiri students and we have the programme for out-of-school children. Can somebody who has no plan for the country think about that kind of programme? (Crowd shouts NO!). You will ask some of those people who are deceiving you now and who hired some people from outside the country to go on social media and tell all kinds of lies, that when they were in power did they build any nursery school for anybody? (Crowd shouts NO!) Ask them, ask them, I say go and ask them. If they did not build nursery schools for anybody, what did they use our money for? They built prisons or universities for you? I will build universities for you, I will build secondary schools for you, I will build primary schools for you. They say we have no plans for this country but we established the Sovereign Wealth Fund (SWF)—out of the money that comes into this country we reserve a little so you just don’t squander it. This is a government that introduced for the first time what we call the SWF and I want to thank the Governors from the states who keyed into the SWF idea. In addition to the SWF, you know that there are some stolen monies, which from time to time government gets back. They have been getting these monies back but we do not know how they are spending it. The ones that have come in within this period, we have not even started spending it but first of all we agree on how to spend it. Because we have security challenges and this money is primarily for security and they used security channels to take it, 50 per cent of it will be used for security, 25 per cent of it for development and 25 per cent of it will be used for future generations. This is the decision we have taken even before we start spending the money. Can somebody who has no plan for the future of the country do that thing? (Crowd shouts NO!) They should come and tell you what they used our monies for. Of course we have been told that I have other opportunities. I have many other things to say but people are getting tired … (Crowd shouts NO!, go ahead) … we’d have the opportunity to talk and talk and talk. Some groups of people have said that you have to vote for your liberation or imprisonment. Some groups of people came, and I read it in the papers, when they see people in government maybe governors, ministers, commissioners and so on … they will say we will draw a line, we are not probing the past because they want to deceive them to get their support. So they will draw a line and start fighting corruption after they cross the bridge. Only two days ago, somebody stood in Port Harcourt and said he was going to catch people in the streets and throw them into Kirikiri. They want power by all means and all what they want to use power for is to lock up and imprison their enemies. I have no enemy to fight. My interest is your interest. My interest is the Nigerian interest and for the future generations and young Nigerians to develop. Not to fight enemies. We must stop corruption. I will not stop corruption by catching people, putting them in trailers and dumping them off to be killed. You can’t stop corruption that way. Someone wakes up and he feels he can jail all his enemies and he thinks that is how to fight corruption? I think we have advanced beyond that point. Somebody wakes up and says ``O, Nigerian women I am going to give you position.’’ And you ask him when you were a Head of Government, you had a cabinet, I have the list of the cabinet members, there was no one single woman. Not even one in the cabinet. So Nigerian women, you cast your votes and go back to the kitchen and die there or you cast your votes to liberate yourself. The Nigerian women must decide where to cast their votes: you vote and go back to the kitchen and die in the kitchen or you cast your votes to liberate yourself. We are ready to liberate all Nigerian women. I am from the Niger Delta. The leader of MEND is one Okah. He is in South African prison. Why is he there? South Africa is not Nigeria where people will say Oh, President (Jonathan) manipulated it. Okah is in the prison because 1st October 2010 when we were to celebrate our independence, our golden year of independence, Okah was procured by some Nigerians to assassinate me. Okah bombed Abuja, but the attempt was to assassinate me and South Africa intelligence system caught him in the plan to assassinate me. 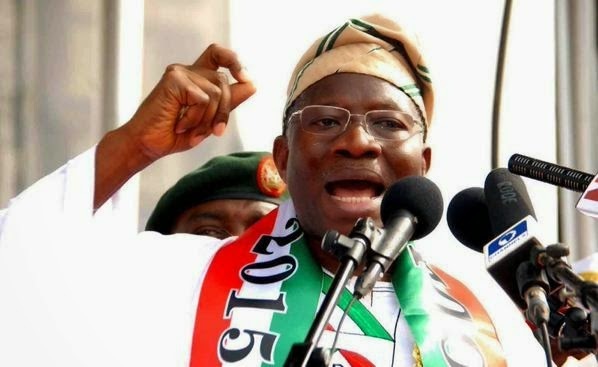 He is now in jail in South Africa and they say MEND dumps Jonathan. 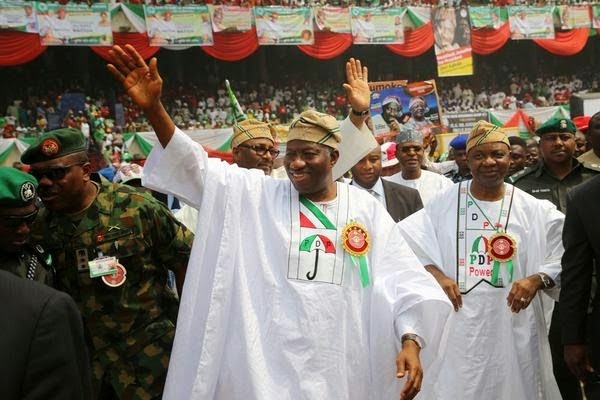 Okah that wanted to assassinate Jonathan, will he support Jonathan? (Crowd shouts NO!) I am told that Okah is supporting some people… I am told that Okah who is in a South African prison for killing Nigerians is endorsing some people. Is that the country you want to live in? (Crowd shouts NO!) Count me out. Let me conclude by thanking all Nigerians, especially Lagosians. Let me sincerely on behalf of my party apologise to you because we are having this rally today so the whole of Lagos is at a standstill. We beg you, we have to do it and we know you love us, will support us and we promise to make sure that… this is the very first government that has supported the industrial sector very well. Ask your brothers and sisters in the private sector, if they are sincere they will say that we have come up with policies that have encouraged commerce and industry. Government alone cannot employ people. The private sector must grow to create jobs for the people. Bear with us because the PDP government will continue to encourage the private sector to create jobs for Nigerians. Finally, let me tell all of you especially those of you, who want to go to the National Assembly that we just had a national conference. The document from that conference, because of the controversy we have in the present National Assembly, you know how chaotic the present Assembly is, we know that if you bring that document to the Assembly they will dump it. So we want to present it to the next Assembly. So those people you are sending, if you mean well for this country, you must vote people who can go to the National Assembly, discuss and adopt that document that our leaders have agreed so that this country can move forward. 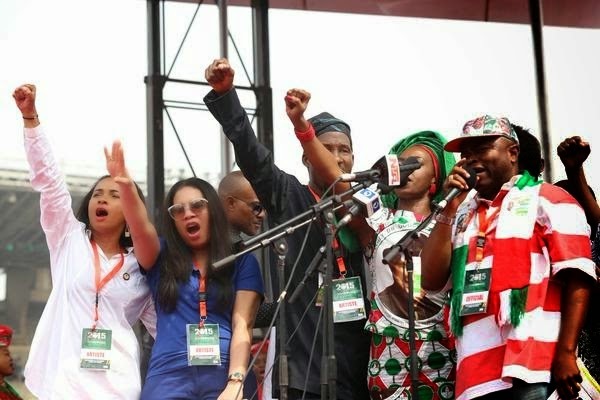 I stand today in the city of Lagos, in the south west on behalf of the leader of our party, Alhaji Muazu, the Vice President and all the leaders and promise that if you vote the PDP en masse to the National Assembly and to the Presidency, we will adopt that document so that this country will move forward. That document is to liberate you, we did not influence it, our fathers, mothers, brothers and sisters that are credible came up with it. Ask them, we did not influence it. I did not ask them to dot any `I’ or cross any `T’ because I have no personal interest. My interest is the Nigerian interest. It is either we vote to be prisoners as we were- and I will tell you maybe some of you do not know, in 1983, I don’t know for the young people, some of you who are writing all sort of things on the social media. In 1983/84, what they called discipline as a post graduate student instead of reading my book, the whole night I queued up to buy two tins of milk. And they say that is discipline. You must vote for your liberation, you must vote for your development, you must vote to take Nigeria to the moon. You cannot vote to take Nigeria backward. Leave us who are half dead to bury our dead. You must vote for the progress of this country, you must vote for the Nigerian youth, you must vote for the Nigerian women. PDP!… POWER!